Most people will probably know this band from their split CD-R (200 copies) with White Hills. The band recently had a split 7” with BONG on Box Records and this is the bands first 12” record. The band have released several do it your self CD-Rs in various forms and one cassette tape made in 90 copies. The first side of this record (the dark label) is a completely new to me. It is called Every River has a Source. This piece really takes me away into a strange dream world when I hear it with the strange vocal samples, repetitive looping and layers of instruments that come in to make these amazing sound collages. This is psychedelic stuff for sure and it just builds up until your mind is fully blown. This is real LSD music. The white side is a live track and the first tracks that the band recorded as a band. You can hear them on the CD-R that comes with the split 7” with BONG. It was recorded at Saki Bar in Manchester. The bands first show with White Hills. This is also very psyched out stuff and a bit more keyboard oriented and very psychedelic as well. 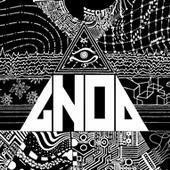 Anyway, one must be patient and allow yourself to be dragged into the dark, drone world of GNOD. The LP is quite short on details. The labels don’t say which side is which. There are no song titles and no list of who plays on the record, where it was recorded or anything. Cool front cover though. I guess it is all part of the bands mystic. Pressed in 500 copies on vinyl only.